Hey Sugar Fix Fans! It’s April…We’ve changed the quote in the window at The Loft and we’ve changed the flower boxes all in hopes to welcome spring! We would love to say we are enjoying this weather after Dr. Emery‘s return from Florida, but this week has really been crazy! Outside of The Loft weather conditions have been grey, cold, and dreary, but inside The Loft, we were busy warming things by designing smiles! Wax up of teeth needed to perform smile transformation. In The Loft, we have been busy designing smiles with Dr. Emery. Several of our patients have come in and were not sure what they want or need to improve their smile. After discussing their options, they were blown away at what we can deliver! Below is an example of a patient that came in with a “black triangle” in between her front teeth that were also chipped on the edges. Additionally, she was concerned with the color and sensitivity of her teeth and wanted to see what options we had. We recommended that the patient use the at-home KOR whitening treatment to get great results with little to no sensitivity. Her results in the second picture and look amazing!! Finally, she decided that two veneers on her front teeth would look great to get the shape she was looking for and to fill the gap. 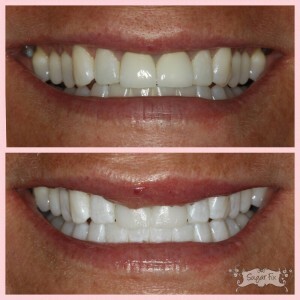 Her final results are truly stunning after the veneers! The patient said it has completely changed her overall appearance and she is very confident with her new smile! Another patient came in this week and her two front teeth were already crowns. She was unhappy with the color of the crowns; they were porcelain crowns with metal underneath, giving it a very opaque look. 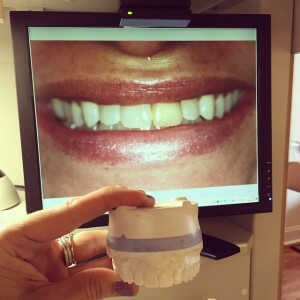 After meeting with Dr. Emery, we decided the best thing to accomplish the end results she desired was to do a Zoom whitening and remove her old crowns. The photo below shows the temporaries she is currently in. What a difference! The patient is very happy with her results and is excited to get her new all-porcelain crowns that will look completely natural in 2 weeks! 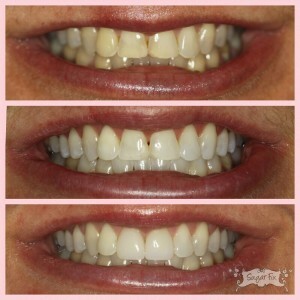 Before and after- Whitening and Temporaries! We also spent Thursday in a very creative way! We filmed a VERY special video for our patients as well! Be on the look out for the Sugar Fix e-mail on your birthday for a special surprise!